The expression "actions speak louder than words" came to mind the yesterday when I heard Oracle were releasing a whole stack of new x86 hardware. A lot of people were concerned that Oracle were going to completely ditch x86 in favour of SPARC, but it looks like Oracle will be staying in the x86 business, albeit without AMD, for at least a whilst longer. Yesterday's announcement saw a refresh of pretty much the entire current x86 rackmount server and blade range with the the existing 2 socket x86 servers getting an 'M2' version with access to the latest Intel Xeon Processor 5600 Series CPUs (formerly known as Westmere-EP). 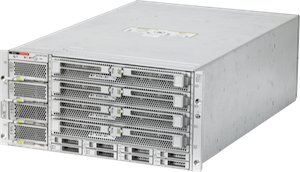 At the same time Oracle introduced two new, high end enterprise grade, 4 and 8 socket capable servers using the Intel Xeon Processor 7500 Series CPUs (formerly known as Nehalem-EX). These weren't the only new releases. At the same time Oracle announced new storage and networking blade modules. So I think they've got most major operating systems covered and I think Oracle will be kicking their sales and marketing machines into top gear in an attempt to push as many of these out the door as possible, to see if a) they can make x86 profitable, and b) to see if they shatter the profit margins they said they'd get out of Sun following acquisition.